First (rough!) drafts were due today, and this week we covered writing for radio. Specifically, we discussed radio as a conversational medium and as a visual medium, and we started reviewing transitions. We listened to The Whitest HBCU in America from NPR (a new piece for us) and Writing Out of Tape (a classic) from Transom/HowSound. 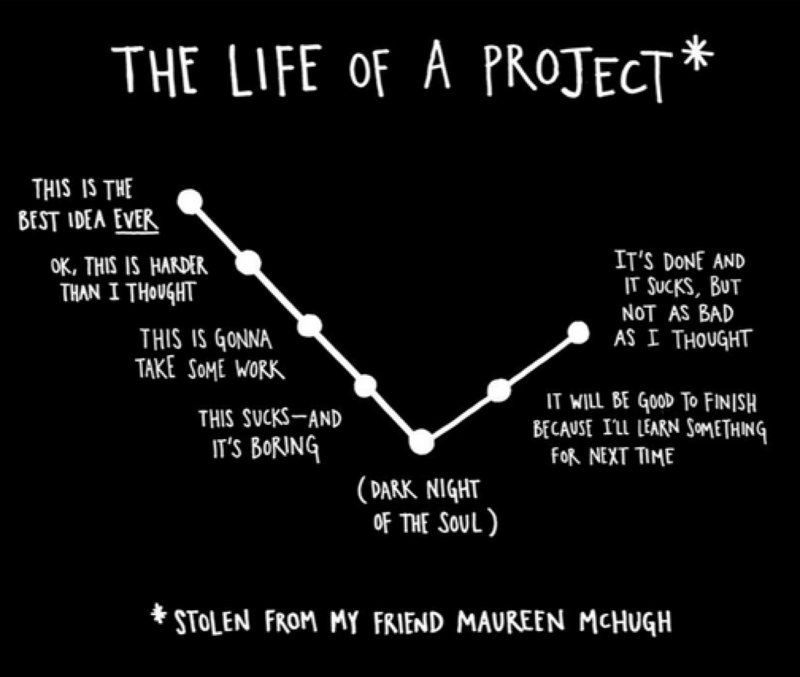 We also looked at this handy The Life of a Project chart, to let everyone know the doom they're feeling is warranted. For homework, they're reading the edits chapter of Out on the Wire, writing second drafts, finishing interviews, and listening to How Not to Write for Radio (Transom/HowSound) and Reagan's Neighbors (old Scott Carrier). With Halloween around the corner, we're also recommending Snap Judgement's Spooked and Campfire Tales.